The game was Rack “n” Roll. We were very happy to stay in the same build location for the first time! The team traveled to St. Charles, Missouri to compete at the St. Louis Regional. We had one of the few of robots that could hang a tube in autonomous mode. Our team was ranked #7 with a record of 8-5-0. We partnered with 1723 and 1625 and made it to the semi finals, losing to 217, 148 and 2133. This was a year when Gracious Professionalism played an important role for our team. After flawless practice rounds, our transmission failed in the first matches on Friday. It seemed as though we were in a hopeless situation. We didn’t have a spare and there weren’t any for sale. Announcements were made and two teams graciously gave us their spare transmissions. With the guidance and optimism of the Swartdog mentors, the students worked hard to replace the transmission and go on to the semi finals. We learned a great deal about perseverance and teamwork that year. We also made a decision that going forward we wanted to emulate the teams that demonstrated Gracious Professionalism by sharing the robot parts we needed, even though they knew we would be competing against them. Rack ‘n Roll was the 2007 FRC game. The two alliances of 3 robots competed to arrange 3 different types of tubes called Keepers,” “Ringers” and “Spoilers” on the common central game piece called “The Rack”. “The Rack” was a center structure containing 24 “spider” legs and was moved randomly before the start of each match. The game was made up of two scoring periods. The first period was autonomous, lasting 15 seconds. In the autonomous period, robots tried to place a “Keeper” tube on one of the spider legs of the Rack using a color vision tracking system to find one of the four target lights at the top of the rack. Once placed, a “Keeper” tube couldn’t be removed or “Spoiled”. During the second period (2 minutes), the robots were driver controlled. 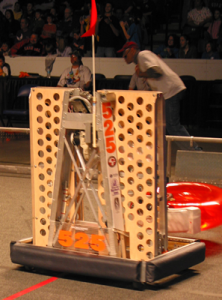 In this period the teams attempted to score more points by using the robots to add “Ringer” onto the spider legs or by “Spoiling” the opposing teams score b placing a black tube over the “Ringer”. Points were earned and scored exponentially by the number of consecutive Ringers and Keepers in a column or row. Alliances scored additional points if, by the end of the match, their robots were in their home zone and had been lifted off the floor by 4” by another robot before the final buzzer.